Everyone loves....a San Antonio getaway! If you are considering a Texas weekend getaways, this beautiful city is an excellent choice. The natural beauty, historic sights, great hotels and interesting restaurants make San Antonio vacations a favorite. San Antonio's strong Hispanic/Mexican influence, give it a great deal of character and charm. Best time to visit: October through April is the best time to go on a San Antonio getaway. The summer months are very hot and humid. Luxury hotel suggestions include: Drury Plaza Hotel Riverwalk Hotel on the Riverwalk, a 24 story hotel in the old Alamo Bank Building with historical elegance....many of the original features were preserved and Hotel Valencia Riverwalk, a contemporary, luxury hotel on the river walk. Bed and Breakfast Hotel:, a small inn right across from the Riverwalk with complimentary breakfast. For families: Drury Inn & Suites Northwest, is a good value with free breakfast and a pool or the Hampton Inn & Suites Riverwalk, across from the Riverwalk and includes a free breakfast. 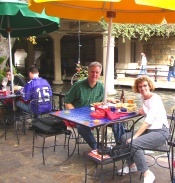 River Walk - 3 mile path built 20 feet below the city streets is lined with shops, outdoor restaurants and benches. There are boats that take tourists up and down the river or it's a lovely stroll. La Villita (Little Town) - the original settlement of Old San Antonio that is now filled with shops and art galleries. The Alamo - famous site of a long, bloody siege during the Texan war for independence against Mexico. Missions National Historical Park - preserves 4 Spanish frontier missions along the river: San Jose San juan, Espada and Conception. HemisFair Park - Tower of the Americas (great views) and Institute of Texan cultures (includes 27 ethnic and cultural groups). El Mercado (Market Square) - arts and crafts from Mexico, restaurants and Mexican music. San Antonio Museum of Art - Collection of Spanish, Mexican and pre-Columbian works. Texas Hill Country - Make sure and check out this nearby region with its beautiful scenery, charming towns and many attractions. Boudro's on the Riverwalk - 421 E. Commerce St., Creole, Cajun, varied menu, famous for guacamole, outdoor seating; Mi Tierra Cafe - 218 Produce Row, Tex-Mex food, open 24 hours, strolling musicians; Guenther House - 205 E Guenther, built next to Flour Mill in 1860. Good for breakfast. Closes early. For a San Antonio Romantic Getaway, try Las Canarias - (210) 518-1000, outdoor seating, good service, diverse menu.